The dish originated in the rural areas of the semi-arid and salt-rich Issan plateau. In a region where food shortages are both a threat and a reality, the Issan farmers are known for their positive attitude and calm demeanor, even while struggling to make a living. Thus, every house in upcountry Issan has its own kitchen garden where vegetables and local herbs are grown. 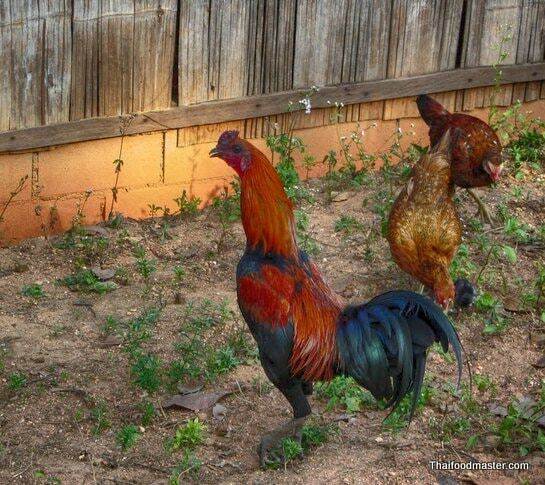 Chickens roam at will around the house; the yellowish meat of these free-range birds is denser, leaner and more flavorful than that of commercially raised chickens. 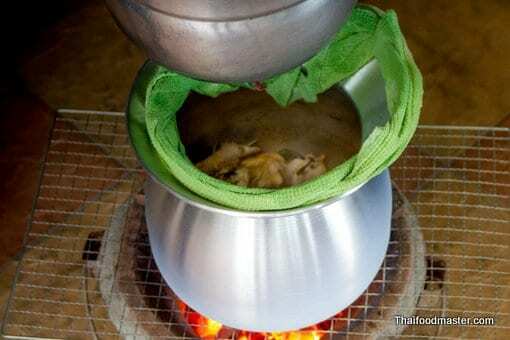 The name of the dish – “under water chicken”- refers to the cooking setup, where two metal pots are stacked on top of each other. 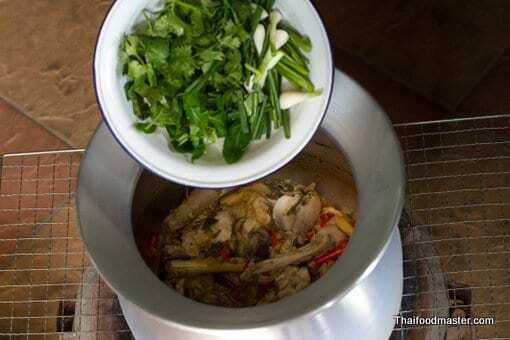 The lower pot is for braising the chicken with the aromatic paste, while the upper one, filled with ice-cold water, acts as the lid. 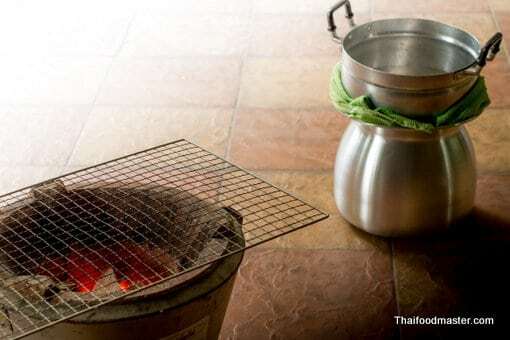 Any gaps between the two pots are sealed tightly using banana leaves, wet towels or even wet tissue paper. Reflux distillation: a simple science found in folk cooking. This method allows the meat to retain a moist, tender texture, perfumed by a generous amount of the aromatic paste. 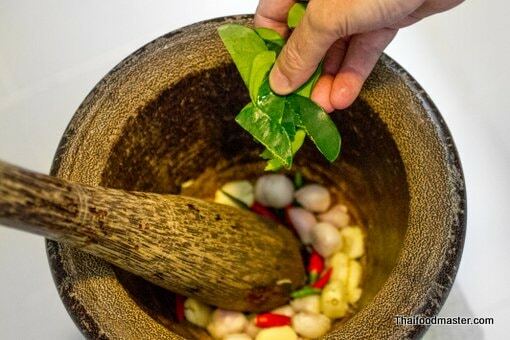 Without adding any water, the juices from the meat, the paste and the herbs create a delicious sauce with an extraordinary flavor. 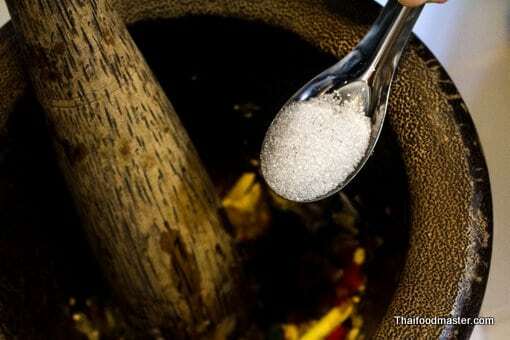 Gai dtai naam applies simple science to folk cooking, using the same principle of ‘reflux distillation employed in a lab to extract essential oils. 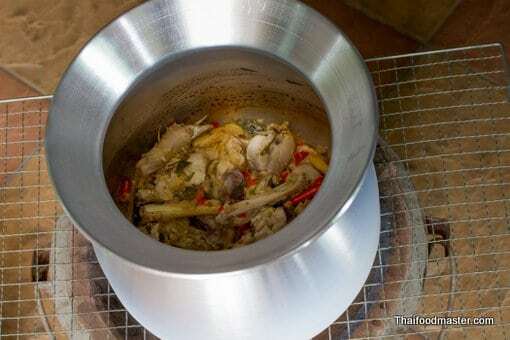 Here, the cooking vapors condense onto the chilled lid, locking smells and flavors in the pot to produce an incredibly fragrant and tender chicken dish. 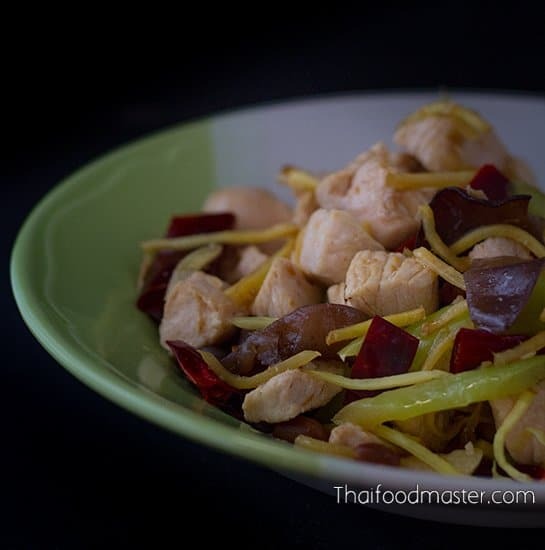 This northeastern- (Issan) style Thai braised chicken in coarse aromatic paste is very easy to prepare and requires only basic cooking skills. 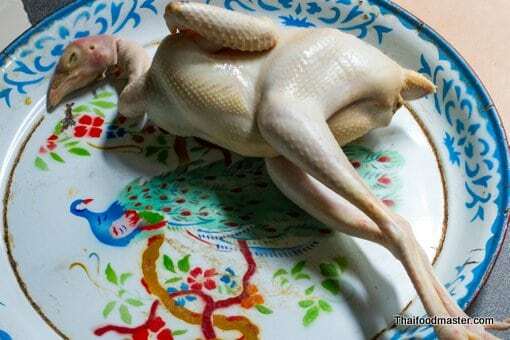 In this demonstration, we use a free-range chicken, complete with its internal organs, head, neck and feet. 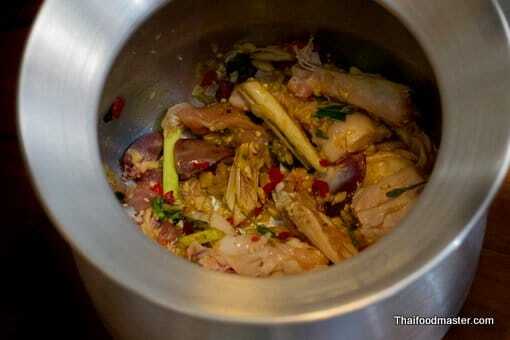 I find that adding the chicken feet and the head to the pot create a thicker and richer sauce. 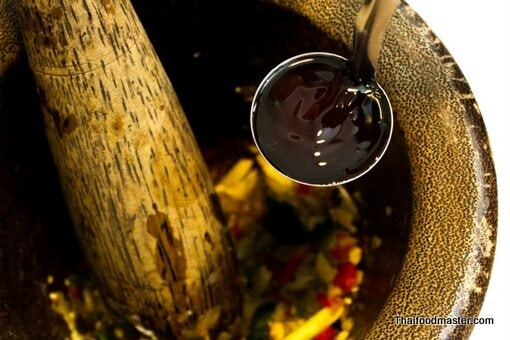 Remove and discard the skin; this allows the essential oils from the paste to permeate the meat. 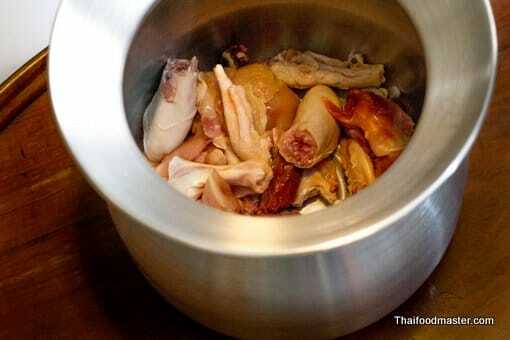 Chop the entire chicken, including the bones, into bite-size pieces. 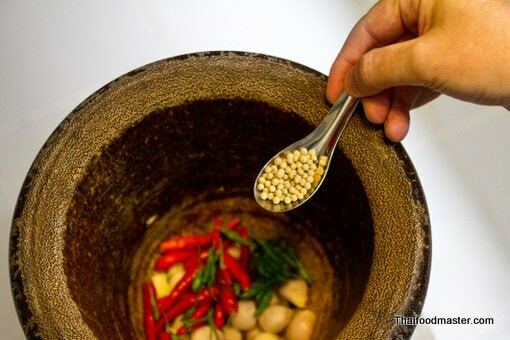 Prepare the ingredients for the aromatic paste. 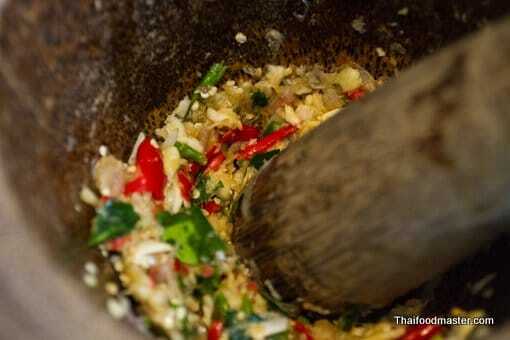 Place the garlic, shallots and chilies into the mortar. 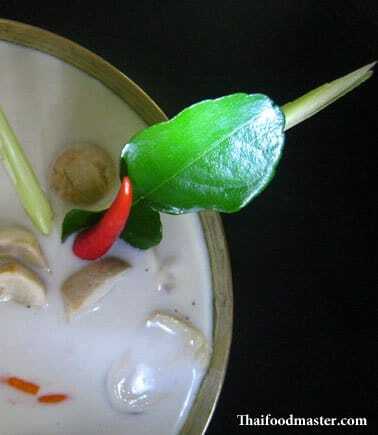 Add the hand-torn kaffir lime leaves. Pound all the ingredients together to form a rough paste. 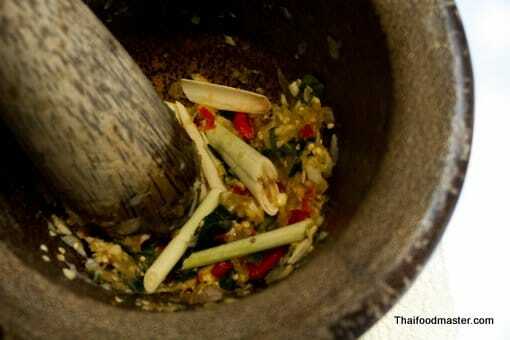 Add the lemongrass stalks and, with the pestle, bruise them to help release their fragrance. Place the chicken in a pot. Mix everything. You do not need to add water. 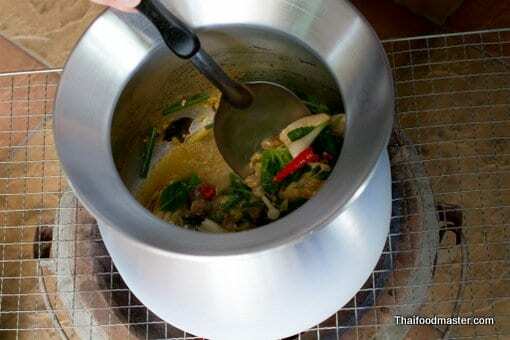 I will cook the dish as it traditionally done - on a Thai charcoal stove, outdoors. 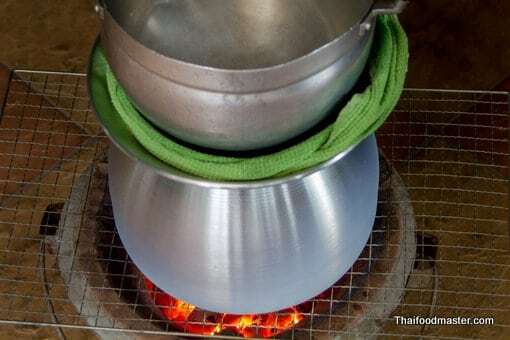 But you can use different setups: this picture shows a simple setup on a gas stove. Make sure the gap between the two pots is sealed properly. This picture demonstrates how wet tissue paper is used to seal the gap. Here is my setup, using the charcoal stove and the two pots. I use a kitchen towel to seal the gap between the two pots. 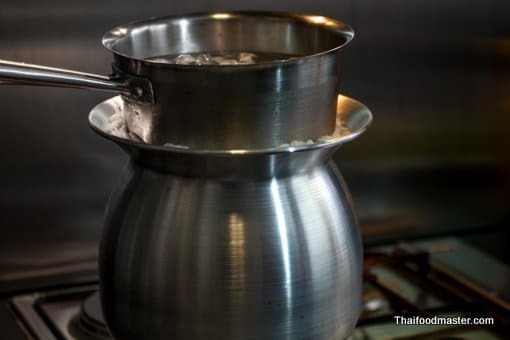 Place the pots on the stove, and turn the heat to medium low. 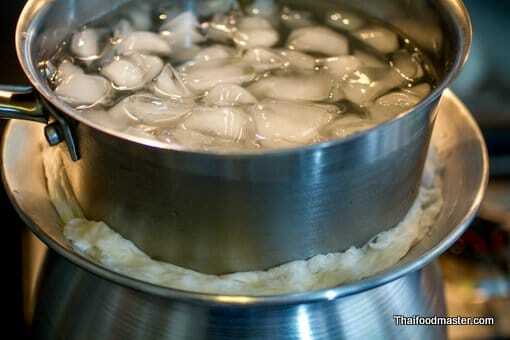 Make sure that the top pot is filled with iced water. Check that there are no steam leaks, and cook until all the ice in the upper pot has melted. 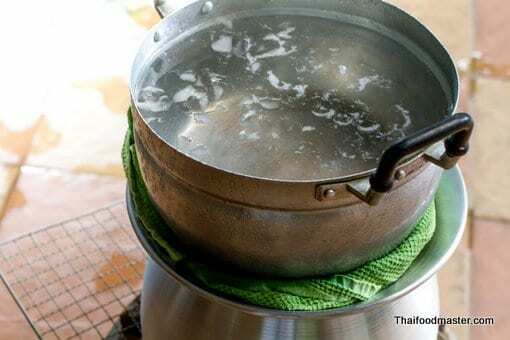 Do not allow the water in the upper pot to warm. 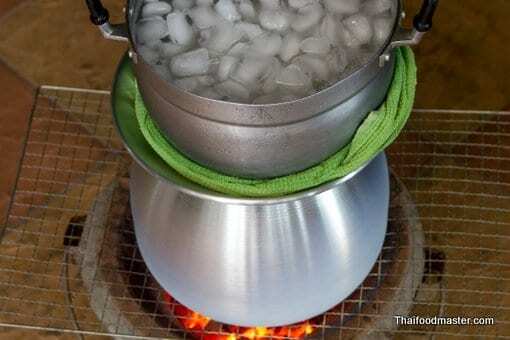 When all the ice is melted, remove the upper pot and discard the water. Reposition the top pot, and re-fill it with cold water. 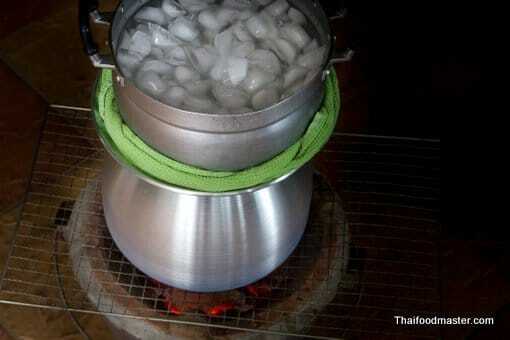 Continue cooking until the ice has again melted completely. 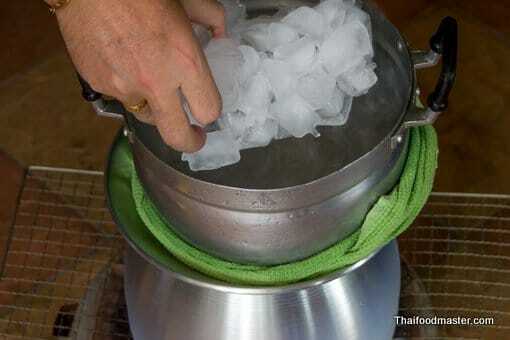 Repeat this step – changing the water and replacing it with ice, then melting the ice - three times. Cook the chicken for about 1 1/2 hours. 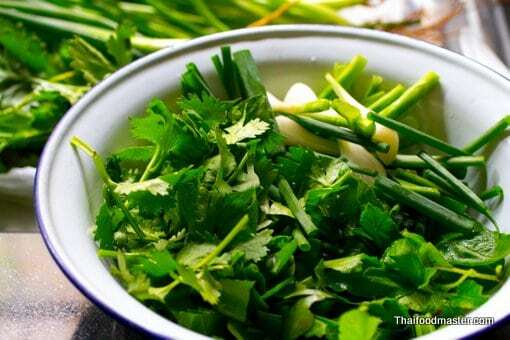 While the chicken is cooking, roughly cut the holy basil, coriander, saw coriander and the green onions; set aside. When the chicken is done, remove the top pot. Mix the herbs with the cooked chicken. If you are cooking outdoors on a charcoal stove, be aware that your neighbors may become entranced by the aroma and join you for the meal. 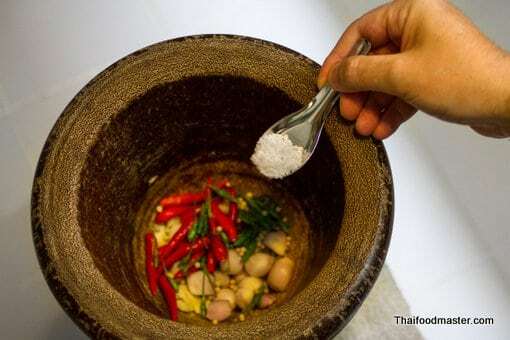 Prepare a papaya salad, hot sticky rice and a bottle of Thai whiskey to go with the meal - enjoy the eating and the company! I am from Bangladesh . A culinary expert. 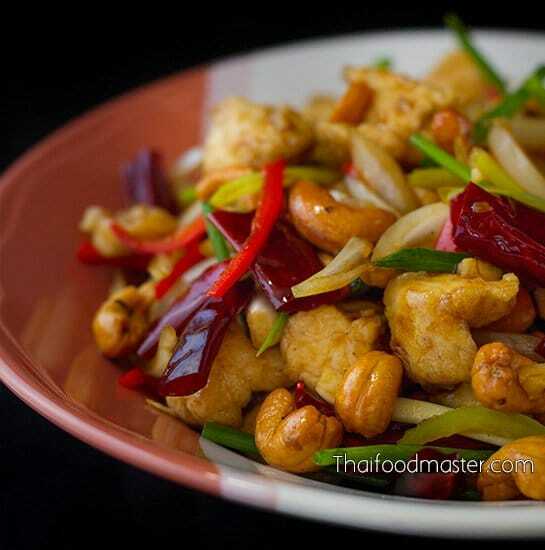 Love Thai Food Master. 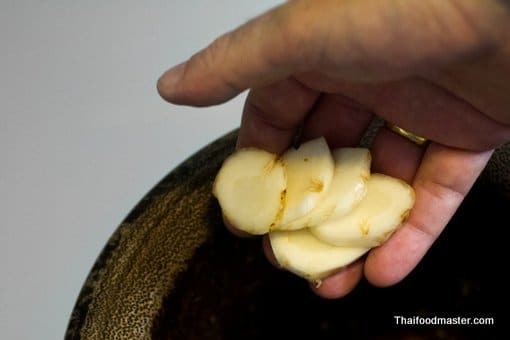 I have been following your recipe after I did my Chef course on Thai Cuisine from Bangkok Thai cooking academy and later took a private course with Chef Nooror of Blue Elephant. 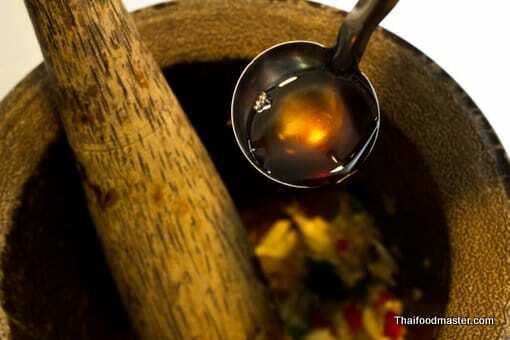 Presently I have my Boutique Thai Cooking School, name JEWELS KITCHEN. I understood very well the recipe but my question is ‘ why the iced water on top ‘ ? Isn’t slow down the cooking process ? One can live the Chicken in low heat. Greetings Shaheda Yesmin, The heat source is from below, the iced water condenses all the essential oils (volatile oils), and water soluble components in the vapors back to the pot. Please note that the process takes 90 minutes to cook without adding any liquids whatsoever. 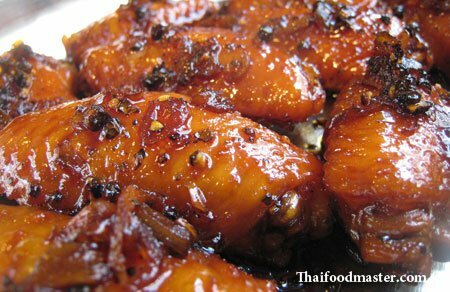 The chicken comes out fully cooked, soft and tender. I began traveling to Thailand in 1987 and have visited the Kingdom numerous times since. Took our then young children to Thailand trekking to aide Akha Hilltribe with Drs. A few times. Have visited such as Nong Kai, Mae Hong Song, Ubon Thani, Hua Hin, BKK, etc. 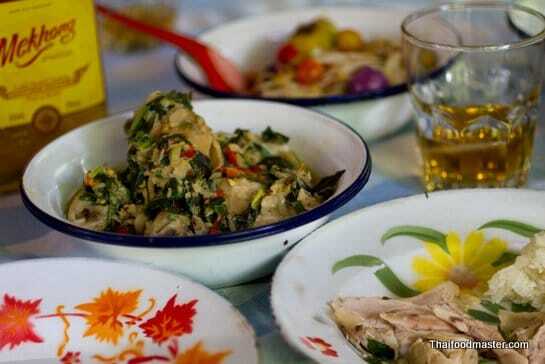 the cuisine of Isan is my favourite. 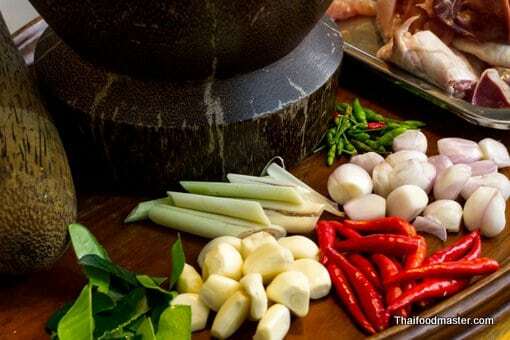 Began cooking Thai cuisine in the 70’s but became serious about it after we took classes from James Beard award winning author, teacher, and friend, Kasma Loha-Unchit in 1986. 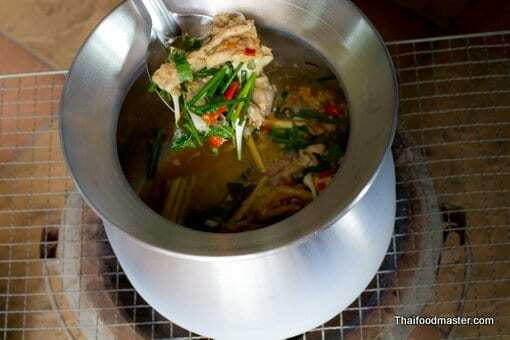 Have learned over the years from street vendors, five Star Chefs, and home Thai cooks. I was drawn here by the authentic recipes! This is a stunning dish! I made it last night here in the UK and was amazed at how much sauce was created. The ice water lid does an amazing job. I’ve made a couple of your other dishes and they were also great. Keep up the good work! This recipe looks great. I haven’t seen this method used to utilize condensation, however I certainly understand the science behind it. Also, I like that you stuck with the traditional methods and ingredients. I’ll have to add this recipe to my arsenal. Thank you so much for sharing it! 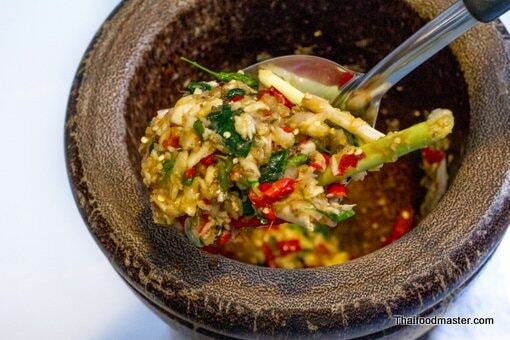 I started picking up Thai cooking after marrying to a wonderful Thai husband. 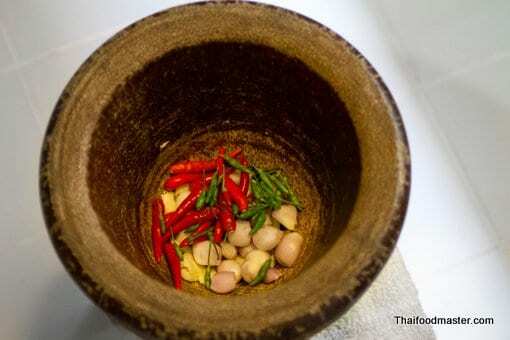 Now my friends and family love anything but Thai food. Your website is my most favorite site by far. 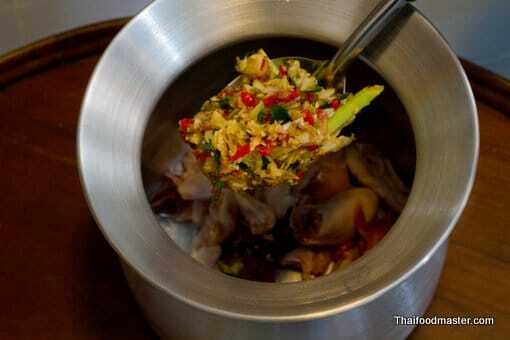 Your recipes are traditional and authentic yet very exotic and sophisticated. Please keep sharing your knowledge.